PEC has a long tradition in accurate high power testing. PEC’s wide range of cell test and formation equipment serves the full product life cycle of EV and HEV large format cells, starting from the initial stages of R&D, over validation and mass production. In a continuous effort to improve PEC’s product offering and reduce the cost for its customers, PEC is announcing its 4th Generation Cell Tester, the ACT0550, replacing the current SBT0550 24 channel model. The Advanced Cell Tester (ACT) delivers this promise and sets the new bar in large format cell testing systems. A quick view at the specifications shows 80 channels per rack, 50A per channel, full parallel capability at a 100 µsec internal sampling frequency. 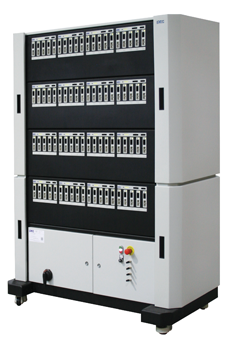 The new ACT0550 Gen 4 test rack is configurable by the end user in different channel configurations: 80 x 50A, 40x100A, 20x200A, 16x250A, 8x400A, 4x800A, 2x1600A, 1x3200A or any combination required by the test regimes. Due to highspeed fiber-optics communication between the channels there is no loss in functionality while using parallel channels. Also in terms of precision the system is raising the bar, with 100 µsec based internal sampling, control and capacity calculations, FPGA hardware controls for both current and voltage and a ± 0.005% FSD accuracy on the voltage readings. This is 10 times better than PEC’s previous offering and 100 times better than competing products in the same power range. A major challenge in high power test systems is the thermal management of the equipment. Over the years PEC has used its vast experience in water-cooled power electronics to eliminate all unnecessary fans and implement an internal cooling system of the power electronics. This innovative cooling technique was introduced a few years ago in PEC’s cell formation towers. The same platform has now been standardized at PEC and will be used as the basis for all new PEC test systems. As an immediate effect of this high performance cooling platform the 20kW ACT0550 test system will turn your cell testing lab back into area without heat and noise pollution. The improved cooling and elimination of external fans easily doubles the MTBF of the equipment, eliminates filter replacement and dust collection inside the power electronics. Besides these major improvements the system has all best-in-class features and specifications on board from its predecessor, such as 4 automatically switched current ranges, ±0.03% FSD current control, 100 µsec rise times, temperature sense per channel…. Building on the capabilities of the new hardware platform, the simulation capability of the system has been extended with a 100 µsec near “real-time” data storage capability. The system also supports PEC’s automated climate chamber control, as well as the integration with external equipment and sensors via the Auxiliary IO system. All these innovations are made to help today’s test engineers in their new test requirements. New testing procedures such as Coulombic Efficiency and extended drive cycle simulations are supported out of the box, with the required accuracy to make better predictions on performance and lifecycle.